MIAMI (AP) The law of averages was on full display. DeMarcus Cousins and Jrue Holiday couldn’t keep losing in Miami forever. And the Heat, a night removed from one of the best shooting performances in franchise history, sputtered. The result: Everything seemed to work for New Orleans. 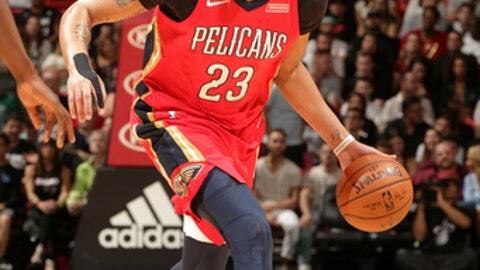 Ian Clark scored 19 points, Anthony Davis added 17 and the Pelicans used a big second-half run to beat the Heat 109-94 on Saturday night. Cousins had 16 points, eight assists and seven rebounds for the Pelicans, who were 15 for 25 from 3-point range and shot 53 percent overall. Davis actually took 11, but Gentry’s point was made. The Pelicans had 27 assists on 39 field goals, and Clark scored 14 points in the second half. E’Twaun Moore finished with 15 and Holiday had 13 for New Orleans, which held Miami to a 4-for-16 effort from 3-point range after halftime. ”We did a really good job defensively,” Gentry said. Tyler Johnson scored 20 points for Miami. A 17-2 run put New Orleans up by 17 late in the third, and the outcome was not in doubt from there. ”They never looked back,” Heat coach Erik Spoelstra said. Goran Dragic and Wayne Ellington each scored 13, and Josh Richardson had 12 for Miami. A night after the second-best shooting game in team history, Miami shot 42 percent. And coming off a 16-for-25 effort from 3-point range in that win over Dallas, the Heat went 10 for 32 from behind the arc. They were apparently due to go cold. And Cousins and Holiday were apparently due to win in Miami. Holiday was never part of a victory in any of his first 14 appearances at Miami. Cousins had played in Miami seven times, also with no wins. Finally, those streaks ended. Miami got Dragic and James Johnson back from injuries – albeit briefly in Johnson’s case. He aggravated his case of right ankle bursitis and left after eight minutes, eventually retreating to the locker room for treatment and not returning. Dragic was also clearly laboring, wearing a sleeve on his strained left elbow and flexing it often. Dion Waiters was out with his sprained left ankle, while Hassan Whiteside and Justise Winslow remained sidelined for the Heat. Pelicans: It was New Orleans’ 44th and final road game of 2017. The Pelicans went 18-26 in those contests. … Cousins’ streak of eight consecutive games with at least 23 points ended. … The Pelicans love working weekends. They’re 5-1 on Saturdays this season, 2-0 on Sundays. Heat: Miami still has not had more than two consecutive home wins this season. … Udonis Haslem got in for the second consecutive night and immediately made an impact, drawing three fouls in his first two minutes on the court. With Whiteside out, the Heat relied in large part on Kelly Olynyk and Jordan Mickey for defense against Davis and Cousins. Olynyk got his fourth foul early in the third, and Mickey had five fouls by the end of the third. Pelicans: Host the Brooklyn Nets on Wednesday. Heat: Host the Orlando Magic on Tuesday.